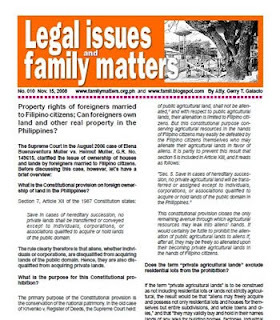 Legal Updates on the Family Code Philippines and relevant matters: Property rights of foreigners married to or living in with Filipino citizens; Can foreigners own land and other real properties in the Philippines? i want to ask ur opinion about these... my grandparents sold their piece of land, my tito's and tita's are asking if they have the rights to intervene since they don't want my grandparents to sell it? Succession (or in layman’s terms, the right to inherit) begins only at the time of death of a person. As long as your grandparents are alive, their children (your titos and titas) do not have any legal right to intervene. Your grandparents can do whatever they want with their properties. If the grandparents are already senile or physically/mentally unable to take care of themselves, then their children may file a petition in court asking it to appoint them as the guardians of the persons and properties of the grandparents. I just wanted to ask if a woman already married to a foreigner in which she already acquired the husband's citizenship, can she possibly put her maiden name in the title? example: Jane Santos - using her maiden name..and her husband is Michael Smith.. in the title the wife put "Jane Santos, married to Michael Smith..."---is this possible? ?or it's not really allowed?? The phrase in the Transfer Certificate of Title, for example, “Jane dela Cruz, married to Juan dela Cruz” is merely descriptive of the civil status of the owner of the property. In this case, the owner is Jane and she is married to Juan. So in your example, “Jane Santos, married to Michael Smith” the owner of the property is Jane, not Michael (even if Michael’s name is mentioned in the title). 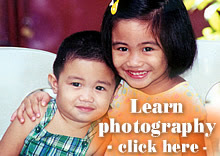 I just want to inquire about owning another residential lot for my family in the Philippines. I am a natural born Filipino but now a US Citizen and currently own a 540 sq mtr residential house and lot. I wanted to renovate and extend my existing house. With this, I am planning to buy the adjacent lot which by subdivision default lot measurement consist of another 540 sq mtr. Now, I’ll have a total of 1,080 sq mtrs. I know that by law, this is more than what is prescribed. Is there a waiver for this? Aside from dual citizenship (I can't because of work security clearance restrictions), can you please advice me of what are my other possible options? I’m single and have a minor child (currently residing in the Philippines). Please consult directly the government offices involved (DTI, Philippine Retirement Authority, etc). Being the implementing bodies, they are better informed about what possible solutions there may be to your situation. One option for you is to purchase NOT a residential lot but a property or business / commercial use (RA 8179 which amended the Foreign Investment Act of 1991): Up to 5,000 square meters of urban land, and p to three (3) hectares of rural land. Another possible option is to purchase a condominium unit. 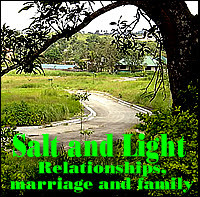 I just want to know what is the legal rights of my husband who is a foreigners and anf brought a property in the Phil. and he was married to a Filipino Citizen and now they are divorce. And my husband wants to sell that property but his former wife don't want to sell it, claiming that property is hers and my husband has no right for that property because he is a foreigners. Is ti true that my husband can't claim his share for that property or how to apply for the separation of property? Im a filipino women who get married with a foreigner. What is the advantage of availing dual citizenship law, compare if I cannot avail? Could I still avail purchase of real property in the Phils. by virtue of RA 8179 and BP 185? Supposing I avail dual Citizenship law, is it automatic to acquire ownership of such property? As I discussed in this post, legally, your husband’s options for claiming the property is limited if not zero in view of the the Supreme Court ruling in the case of “Elena Buenaventura Muller vs. Helmut Muller”. The wife can claim the whole property for herself. Please consult other lawyers who may have opinions different from mine. The advantage of availing of the Dual Citizenship law is that you retain your rights as a Filipino citizen, including the right to purchase or own real property in the Philippines. The only disadvantage might be in terms of taxation; for example, you will have to pay the applicable taxes here in the Philippines and at the same time, be possibly required by your new country to pay whatever taxes it imposes on its citizens. All things considered, it is advantageous for you to avail of this law. thanks for answering my queries. I'am impressed the way you present your answer.I hope you could give idea in pressting answers in bar examinations. Iam still a student of law here in iloilo. If you can give little of your reference iam eager to have it. 1. You should study journalistic writing, especially the use of the inverted pyramid structure (most important things first with the least important in the last paragraphs). Buy any book in high school or college journalism, or enroll in journalism classes (news writing, editorial writing, etc).